When you invest in yourself through our programs and products, or when you join as an affiliate, you are helping to empower women and girls around the world. That is, a portion of the proceeds from programs and products sales are earmarked to support various international organizations, initiatives and causes worldwide. 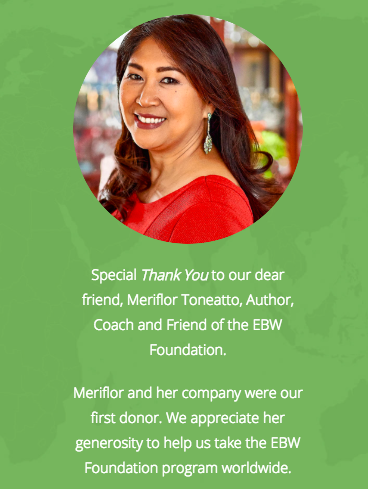 Meriflor’s social promise is to help women and girls achieve economic power and independence through education, health and business. This enables them to achieve their full potential while creating better lives for themselves, their families, communities, and the world — thereby addressing gender inequality in a sustainable way. Empowering A Billion Women Foundation, which collaborates with the United Nations Foundation, providing technology and tools to succeed in business for women in developing countries. Kiva enables people to lend money via the Internet to low-income entrepreneurs in over 80 countries to alleviate poverty. Girl Up supports UN programs promoting the health, safety, education, and leadership of girls in developing countries. Circle of Health International works with women and their communities in times of crisis and disaster to ensure access to quality reproductive, maternal and newborn care.